Directions: Preheat oven to 350 degrees. Line a baking sheet with aluminum foil and top with a wire rack. Lightly grease rack. Mix brown sugar and chili powder together in a bowl. Dredge both sides of each bacon slice in the brown sugar mixture. 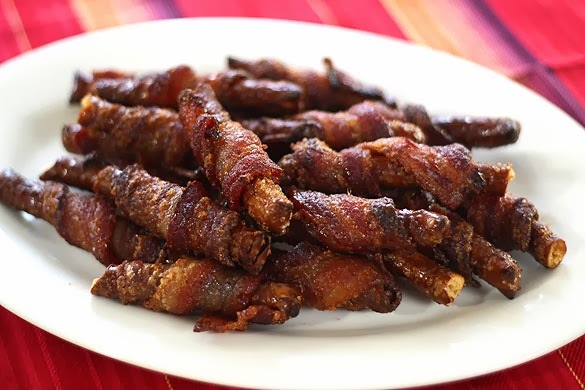 Wrap a coated bacon slice around each pretzel rod, leaving a small space at the bottom of pretzel uncovered for easy handling. Arrange wrapped pretzels on the wire rack atop the baking sheet. Bake in the preheated oven until bacon is crisp, 15 to 20 minutes.To reheat after freezing, place frozen pretzels on a rimmed baking sheet. Cover lightly with aluminum foil. Bake at 350 degrees 10-15 minutes, or until reheated. Watch carefully, as bacon will burn. For tailgating you can prep these at home and then cook on the grill the day of. omg my mouth is watering!! These are really good. Very addictive. I think I might make them for Thanksgiving apps.